In an oxbow lake along the middle reaches of the Yangtze River, a breathy sigh pierces the surface stillness as one of China's most endangered animals comes up for a gulp of hazy air. A slick black back with no dorsal fin arches briefly above the water line before plunging back down. Such glimpses of the shy Yangtze finless porpoise, the only aquatic mammal left in China's longest river and known in Chinese as the "smiling angel" for its perma-grin, are increasingly rare. Pollution, overfishing, hydroelectric dams and shipping traffic have rendered them critically endangered, worse off even than China's best-known symbol of animal conservation, the panda. China's government estimates there were 1,012 wild Yangtze finless porpoises in 2017, compared to more than 1,800 giant pandas, which is no longer endangered. But researchers see signs of hope. Porpoise numbers fell by nearly half from 2006-2012 to an estimated 1,040. But the rate of decline has slowed markedly since then, suggesting that conservation may be making a dent. 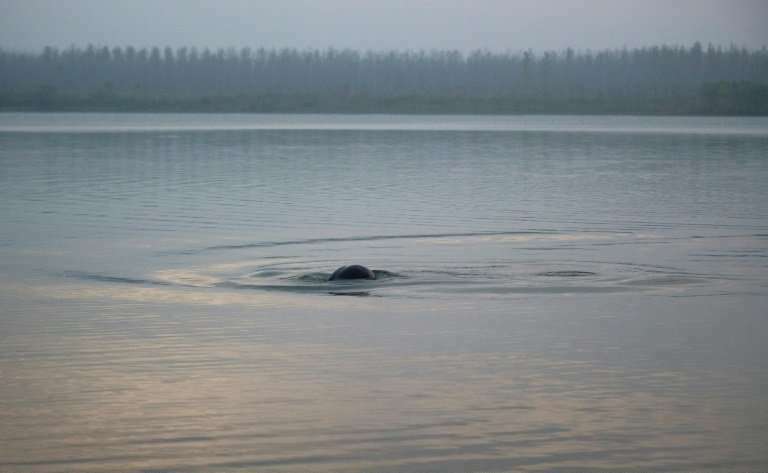 A central component of the rescue effort is the introduction of porpoises to several conservation areas off the busy river, where researchers say numbers have been actually increasing. At the Tianezhou Oxbow Nature Reserve in central China's Hubei province, a curving lake linked to the Yangtze by a stream, around 30-40 porpoises were brought in beginning in the 1990s. There are now around 80. "We found out animals can not only survive but also reproduce naturally and successfully at Tianezhou. That's very encouraging," said Wang Ding, 60, a porpoise expert with the Chinese Academy of Sciences. Researchers also credit official clampdowns on polluting activities and fish overharvesting, artificial reproduction projects, and growing environmental awareness among China's emerging middle class. "The voice and supervision of the public has played an important role," said Zhang Xinqiao, the species' project manager at the World Wide Fund for Nature (WWF). 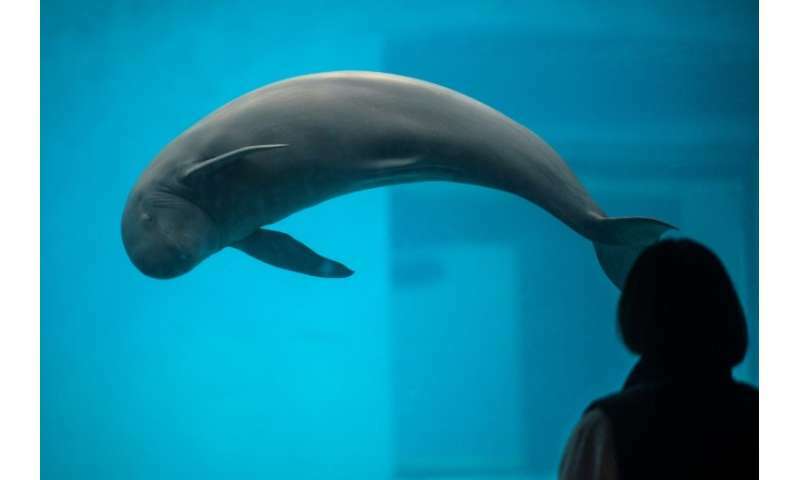 Chinese officials are keen to avoid a repeat of the "baiji", or Yangtze dolphin, the river's only other aquatic mammal, which since 2006 has been considered extinct in a huge conservation setback for China. Losing the "smiling angel" would be a further tragedy, conservationists say. One of the world's few freshwater porpoise subspecies, it is considered a natural barometer of the overall health of China's most important river. The finless porpoise is mentioned in ancient Chinese poems and has been considered a harbinger of rain. Some locals call it the "river pig" for its plump body and rounded headed. Adults can reach two metres (six feet) long and were sometimes eaten, despite not being considered particularly tasty. Their livers were used in traditional medicines. Since China re-opened to the world four decades ago, living standards have soared, but so have air and water pollution. The Yangtze contributes more to ocean pollution than any other world river, according to Dutch NGO Ocean Cleanup. Hydroelectric dams built on the river to satisfy soaring energy demand have also been disastrous for biodiversity. Factfile on the critically endangered Yangtze finless porpoise. But in January 2016, President Xi Jinping called for a river protection push. Steps have included curbs on development, stricter fishing rules and other protection projects. Later that year, a formal porpoise action plan was launched, including increased relocations away from the river, more reserve sites, and research on artificial breeding. The Tianezhou reserve, established in 1992, claims to be the world's first and only example of cetaceans—which include dolphins and porpoises—surviving and reproducing after relocation. Local fishermen near the lake were encouraged to change professions and Wang Hesong, 46, became a patrolman at the reserve. "Look over there, a mother and a baby," Wang said, as his pilot cut their patrol boat's engine at the sight of two arched backs breaking the silvery surface. The shy mammals quickly submerged. "They only come up for a couple of seconds to breathe... We go out patrolling every day and we see them every day," Wang said. The 21-kilometre-long (13-mile) lake offers sanctuary, but porpoises within the river face intense pressure. The WWF's Zhang said the species' days in the river may be numbered. "They have nowhere to hide in the river," he said. "As long as danger exists, such as a further deterioration of natural habitat, it's very likely their numbers could drastically decrease again." 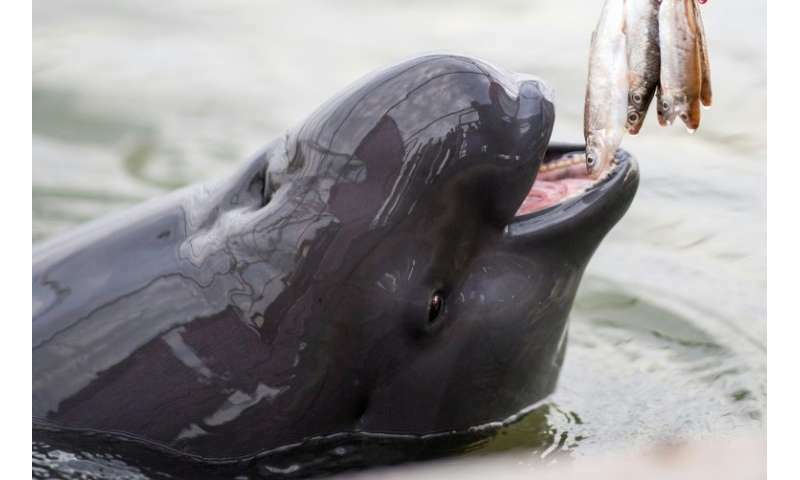 With the clock ticking, a research facility in the nearby industrial city of Wuhan hosts six finless porpoises for research, breeding, and to engage the public. Two gracefully circled by an observation window that looks into their huge tank, playfully tilting their bodies to glimpse the human visitors. "They are saying 'hi' to us," said Liu Hanhui, a volunteer. "I think they understand human feelings." 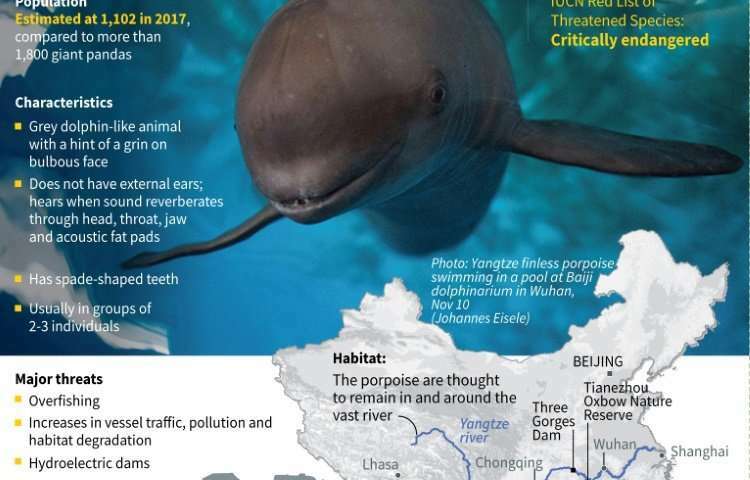 The WWF says adult Yangtze finless porpoises have the intelligence of a three-to-five-year-old child. Just before feeding, they are coaxed to open their mouths on cue, show off their smiles, and shake hands by extending a flipper. Yet they are difficult to breed in captivity. A calf born in June at the dolphinarium—founded in 1980—is just the second produced there to survive more than 100 days, while wild calves often die before adulthood due to human impact on the environment. Liu, an aquaculture student at a nearby university, and 40 other volunteers help feed them on weekends and holidays, and take part in various activities to promote awareness. Conservation programmes and events in the region have proliferated in recent years, backed by scores of businesses and NGOs aiming to instruct the public and encourage greater government protection efforts. "Our development has caused a species to rapidly disappear. I feel like I'm atoning for mankind's crimes," Liu said.